It’s been an amazing adventure building this community with you all, and we are at a bittersweet crossroads today. 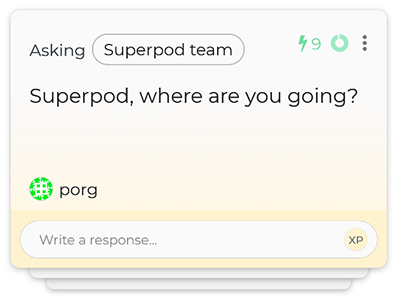 We are sad to announce that we will be closing Superpod today as part of a transition into a larger project. We can’t share any details at this time, but we’re trekking onwards toward the same north star and are very excited about the future. When we first set out on this journey, we did so on the premise that people inherently want to help others. That people aren’t as self-obsessed as much as social media would have us believe. And that we could create an organic culture of helpfulness, where you can instantly tap into anyone’s experience. With your help, we made that dream a reality! Together, we built Superpod into a community where people help others over 6x more than seeking help themselves. In numbers, pods were also *quick* to help — collectively, our pods of experts answered most new questions within the hour. It was exciting to see this experience graph grow and to leverage it over time. Stay curious, and stay helpful! P.P.S. If you’d like to keep in touch and hear from us in the future, let us know here!